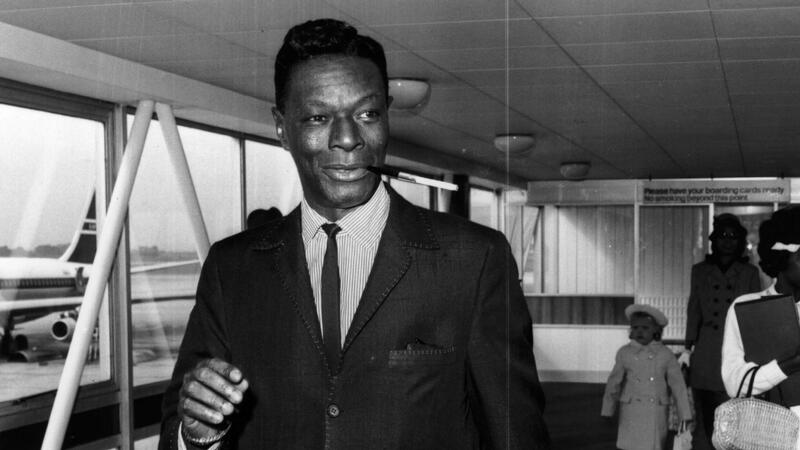 Nat 'King' Cole having a smoke while disembarking from a plane in 1963. "Nat King Cole's voice is really one of the great gifts of nature," Daniel Mark Epstein, author of the 1999 biography Nat King Cole, says. "Remember, he was never trained as a singer. And so, his voice is absolutely pure. He's a baritone with absolutely perfect pitch. He sings the notes true and he hits them right in the center." Born Nathaniel Adams Coles in Montgomery, Ala., on March 17, 1919, the child prodigy was later raised in Chicago. Cole's mother taught the him to play the piano when he was four, and at 15, he dropped out of high school to lead his own bands. His first recordings show the influence of his idol, Earl Hines. By the time he was 18, Cole was married, living in Los Angeles and fronting a nightclub act with a name that riffed on a nursery rhyme — the King Cole Trio — featuring guitar, bass and piano, but not a lot of vocals. The King Cole Trio had a huge influence, inspiring other jazz musicians like Oscar Peterson and Ahmad Jamal to form similar trios. Epstein says if Cole had never crooned a note, he would still be an important figure in jazz. "He really is, I would say, one of our top five greatest and most influential jazz pianists," Epstein says. Johnny Mathis, the 83-year-old balladeer who grew up listening to Cole as his father's favorite singer in the 1940s, later met and became friends with him after moving to Beverly Hills in 1958. "Nat King Cole was the God of popular music in our house," Mathis says with a laugh. "That is the way that I fell in love with his music, is through his piano playing, then of course, I occasionally listened to him singing — that wasn't too bad either." The Nat King Cole Trio had one hit after another, and its leader became wildly popular. In 1946, the King Cole Trio landed a national radio show – the first of its kind to be hosted by an African-American musician. Soon, Cole began to play less jazz and sing more ballads . Nat King Cole plays with his jazz orchestra on the stage of The Apollo Theater, in Harlem, N.Y. in the 1950s. By the 1950s, Cole's repertoire was mostly love songs backed by strings. He told a Swiss television reporter he was simply giving his fans what they wanted. "You see, it's not a case of my personal likes," Cole said in the interview. "I try to please as many people as I possibly can and if I find the people like certain things, I try to give them what they like. And that's good business too, you see." According to Epstein, Cole saw himself as an entertainer, not an activist. But his April 10, 1956 performance in Alabama was a crucial moment in race relations. "He went down to the South to perform with an interracial band, which was pretty bold and offensive to a lot of whites," Eptein explains. "But then he agreed to play for segregated audiences, which offended his black audience." Cole agreed to play a 10 p.m. show at the Birmingham Municipal Auditorium for black audiences, and an early show for white audiences, which attracted a group of local white supremacists. "The White Citizens Council of Alabama had this plot to kidnap Cole from the theater, Eptein says. "The plot failed, but the hoodlums did storm the stage, break up the performance. They knocked Nat Cole off the piano bench and injured his back." A doctor treated Cole in his dressing room, and the singer returned to the stage for the late show. The incident made national news, and seven months later, Cole became the first major African-American musician to host a national television variety show. The Nat King Cole Show had a large audience, but no national sponsor would back a show with a black host for fear of alienating Southern viewers. NBC was losing money, and Cole canceled the weekly program after a little more than a year. However, Epstein says Cole continued to reach a wide audience through records that topped the charts. "That was the great gift of his charisma," Epstein says. "That there was so much passion in his voice and so much intelligence, he was able to transcend the color barrier." Cole didn't live long enough to see his career overshadowed by rock and roll. A heavy smoker all his life, he was diagnosed with lung cancer in 1964 and went into the studio for the last time in June of that year. Only 45 years old, Cole died on Feb. 15, 1965. "He was the nicest man you'd ever want to meet in your life," Mathis recalls of his friend. "Just a very down-to-earth person who happened to be one of the greatest musicians of all time. And he became, of course, a model for so many people, especially someone like myself." Nat King Cole was born a hundred years ago today. He was one of the most influential entertainers of the 20th century. He topped the charts year after year, selling more than 50 million records. He helped push jazz piano in a new direction. And, as an African-American, he paved the way for later generations of performers. Tom Vitale has this tribute. NAT KING COLE: (Singing) Unforgettable, that's what you are. DANIEL MARK EPSTEIN: Nat King Cole's voice is really one of the great gifts of nature. Remember; he was never trained as a singer. And so his voice is absolutely pure. VITALE: Daniel Mark Epstein is author of the 1999 biography "Nat King Cole." EPSTEIN: He's a baritone - and absolutely perfect pitch. He sings the notes true, and he hits them right in the center. COLE: (Singing) Like a song of love that clings to me, how the thought of you does things to me. VITALE: Nathaniel Adams Coles was born in Montgomery, Ala., and raised in Chicago. His mother taught him to play the piano when he was 4, and he was a child prodigy. At 15, he dropped out of high school to lead his own bands. His first recordings show the influence of his idol, Earl Hines. VITALE: By the time he was 18, Cole was married, living in Los Angeles and fronting a nightclub act with a name that riffed on a nursery rhyme, the King Cole Trio, featuring guitar, bass and piano and not a lot of vocals. VITALE: The King Cole Trio had a huge influence on other musicians. Oscar Peterson and Ahmad Jamal formed similar trios. Dan Epstein says if Cole had never crooned a note, he'd still be an important figure in jazz. EPSTEIN: He really is, I would say, one of our top five greatest and most influential jazz pianists. JOHNNY MATHIS: That is the way that I fell in love with his music is through his piano-playing. And then, of course, I occasionally listened to him singing. And that wasn't too bad either (laughter). VITALE: Eighty-three-year-old balladeer Johnny Mathis grew up listening to his father's favorite singer in the 1940s. MATHIS: My dad was a singer. And Nat King Cole was the god of popular music in our house. COLE: (Singing) A buzzard took a monkey for a ride in the air. The monkey thought that everything was on the square. The buzzard tried to throw the monkey off his back, but the monkey grabbed his neck and said, now, listen, Jack. Straighten up and fly right. VITALE: The Nat King Cole Trio had one hit after another, and its leader became wildly popular. In 1946, the King Cole Trio landed a national radio show, the first of its kind to be hosted by an African-American musician. Cole began to play less jazz and sing more ballads. COLE: (Singing) She gave your very first kiss to you. That was Laura, but she's only a dream. VITALE: By the 1950s, Nat Cole's repertoire was mostly love songs backed by strings. He told a Swiss television reporter he was simply giving his fans what they wanted. COLE: You see, it's not a case of my personal likes. I try to please as many people as I possibly can. And if I find that people like certain things, then I try to give them what they like. And that's good business, too, you see. UNIDENTIFIED REPORTER: What do you prefer, to sing or to play? COLE: I prefer to do whatever I do. COLE: (Singing) Mona Lisa, Mona Lisa, men have named you. You're so like the lady with the mystic smile. VITALE: Nat King Cole saw himself as an entertainer not an activist. But his April 10, 1956, performance in Alabama was a crucial moment in race relations, says biographer Dan Epstein. EPSTEIN: He went down to the South to perform with an interracial band, which was pretty bold and offensive to a lot of whites. But then he agreed to play for segregated audiences, which offended his black audience. VITALE: Cole agreed to play a 10 p.m. show at the Birmingham Municipal Auditorium for black audiences and an early show for white audiences. That performance attracted a group of local white supremacists. EPSTEIN: The White Citizens Council of Alabama had this plot to kidnap Cole from the theater. The plot failed, but the hoodlums did storm the stage. They knocked Nat Cole off the piano bench, injured his back. VITALE: A doctor treated Cole in his dressing room, and the singer returned to the stage for the late show. The incident made national news. And seven months later, Nat King Cole became the first major African-American musician to host a national variety show on television. COLE: (Singing) In the evenings, may I come and sing to you all the songs that I would like to bring to you? VITALE: "The Nat King Cole Show" had a large audience. But no national sponsor would back a show with a black host for fear of alienating Southern viewers. NBC was losing money, and Cole canceled the weekly program after a little more than a year. But he continued to reach a wide audience through records that topped the charts, says Dan Epstein. EPSTEIN: That was the great gift of his charisma, that there was so much passion in his voice and so much intelligence that he was able to transcend the color barrier. VITALE: When singer Johnny Mathis moved to Beverly Hills in 1958, he met Nat King Cole. And they became friends. MATHIS: He is the nicest man you ever want to meet in your life - just a very down-to-earth person who happened to be one of the greatest musicians of all time. And he became, of course, a model for so many people, especially someone like myself. 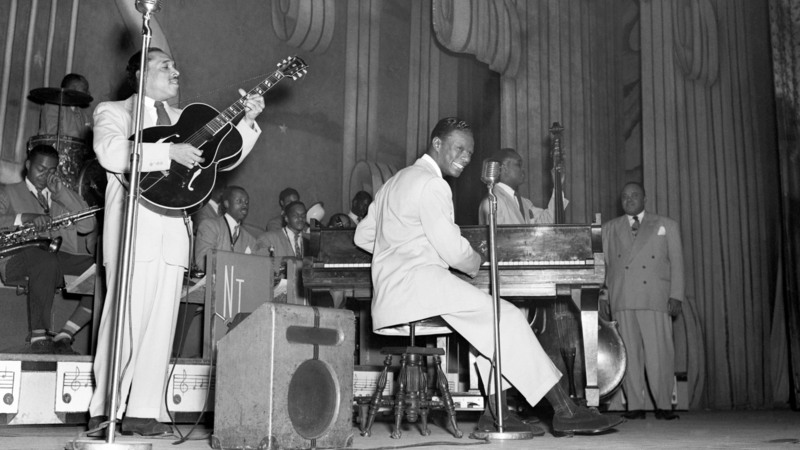 VITALE: Nat King Cole didn't live long enough to see his career overshadowed by rock 'n' roll. A heavy smoker all his life, Cole was diagnosed with lung cancer in 1964. He went into the studio for the last time in June that year. COLE: (Singing) L is for the way you look at me. VITALE: Nat King Cole died on February 15, 1965. He was 45 years old. For NPR News, I'm Tom Vitale in New York. GARCIA-NAVARRO: Lost too soon. Transcript provided by NPR, Copyright NPR.